At the Sophia Lofts, a bakery warehouse in Williamsburg converted to 11 apartments in 2007, you could pick up this one-bedroom condo for $995,000. (It last sold in 2009 for $555,000.) 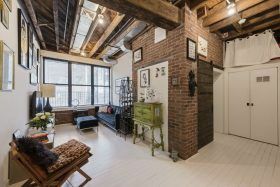 For a hair less than $1 million the pad offers one bedroom, lots of exposed brick, wood beam ceilings, and those big warehouse windows. Although the apartment still has a bit of warehouse grittiness left to it, spaces like the bathroom and kitchen were modernized, while plenty of shelving was added to hold the owner’s quirky collection of stuff. 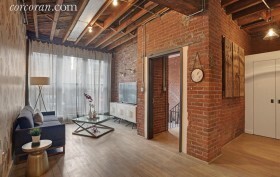 This duplex apartment at the Sophia Lofts at 234 North Ninth Street, a former bakery converted to 11 loft residences in 2007, has a private entrance on Williamsburg’s bustling crossroads of Roebling Street. You can come and go as you like from your own slice of prime ‘burg, a 1,480 square-foot duplex that will put you right in the middle of where all the action is, for $5,500 a month. The interiors are loft all the way, though there are plenty of custom comforts and chic additions that give the classic converted space a distinct modern personality.